Are your dogs and cats living together under the same roof, soul mates, best friends, or mortal enemies? Modern dogs and cats have lived side by side for many generations, some forming strong bonds that transcend the obvious species difference. No dogs allowed where the cats reside. Popular culture would have us believing in this great schism, but does this divide really exist in actual households? Everyone who has ever lived with both cats and dogs will have a tale to tell about the incredible bonds between their cat and dog. They not only tolerate each other, but they also thrive in each others company, follow each other around, sleep in each others beds, play together, even eat each others’ food. Others will reveal that their cat and dog will have nothing to do with each other. One occupies the space in the kitchen and the other dominates in the bedroom; neither will venture across the invisible boundaries that separate their worlds. I’m a cat person, I’ll never have a dog. I'm a dog person, and am not fond of your feline friend. What happens when a cat person meets a dog person? Are they doomed to incompatibility? Maybe not. Dogs and cats can live harmoniously with each other, but it does take some foresight and planning, especially if you want your cat to love your dog and not just agree to co-exist. A lot depends on the type of dog breed you choose and whether you will be introducing a young puppy to a mature cat or a kitten to an older dog. Best case scenario would be to add cats and dogs together at a very young age. Some breeds of dogs are just more tolerant of cats. There is also a major debate as to whether a kitten would be best introduced to a mature dog or a puppy brought into the household with an adult cat. Some breeds, such as the greyhound has a strong chase instinct and don’t do well with cats. Many cat experts will tell you that an adult cat who has never had any experience living with or near dogs will have a harder time making the transition to a lifestyle with a busy, rambunctious puppy. If, however, the adult cat has been exposed to dogs, there is a reason to suspect that the pair will tolerate each other if not become friends. 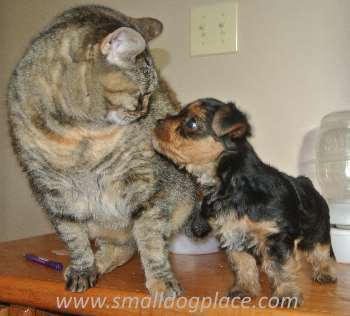 Smaller, calmer dogs seem to do best with their cat co-inhabitants. 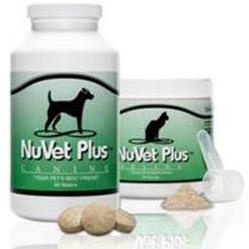 Large breed puppies with very high energy levels may just overpower a cat. If you have your heart set on a family with one dog and one cat, consider adopting them when they are young say under one-year-old. Even though it might seem like a lot of work, experts and pet owners agree that taking in both a cat and a dog within a short time of each other produces the best chance for successful bonding between the species. Dogs and Cats Living Together? It Does Happen! The next option would be to get two pets, a cat, and a dog, who have had a history of being around other pets. Here, you would not need to get a puppy and a kitten. This brings a sigh of relief to many who find the prospects of training both a kitten and a puppy at the same time to be daunting experience—one which the normally sane individual would prefer to shy away from. 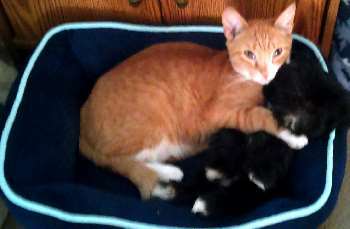 Many people are likely to adopt a kitten or young cat from a rescue or shelter. The benefits of this situation are great. You not only save a life, but you might also gain some information about the former life of the kitten or cat you are planning to adopt. Find a cat that has already been exposed to living with a dog. 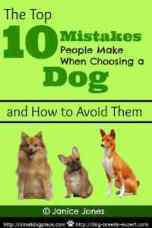 The same holds for selecting a puppy or dog. If you can find a rescue who can get you a dog that has already been introduced to cats, you will be well ahead of the game. A dog breeder may also be able to introduce your new puppy to her cats, giving you a head start on the bonding process. All of this is discussion is assuming that you plan to acquire a dog and a cat at about the same time. This could be an ideal situation, but for the majority of people, this best case scenario may not be what happens in reality. Never assume that the cat of your dreams will automatically love the dog in your life. If Cats already rule your household, don’t expect them to roll out the welcome mat to a new canine addition whether it is a young puppy, adolescent or adult dog. Short and sweet introductions are usually the best and the ones that are entirely supervised will lead to the best outcomes. Never leave a puppy and cat alone together or kitten and an older dog and hope for the best. New additions to the family must be introduced slowly and cautiously with ever present human supervision close at hand. What exactly does it mean to supervise? Dogs and Cats Living Together: Human Intervention Required! Humans have an advantage over pets. We are usually the parent, the alpha male or female, or the leader of the pack. Animals have an instinctive understanding that they may not be entirely in charge if a human is present. If they don’t, it is our responsibility to let them know who the parent is in the relationship. The person who supervises the first few encounters with dogs and cats/puppies and kittens or any other combination should understand that they must intervene if a fight breaks out or if one of the pair feels threatened in any way. 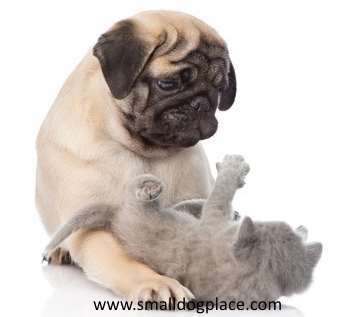 Quick reflexes might be needed to protect a puppy or kitten from the jaws of the other if it looks like both are not going to get along, or bond. The last thing you want is for a puppy to be clawed or a kitten to be injured to the point where veterinary surgery might be necessary. Watch both animals for warning signs that something is not right. This means watching their body language. Don’t allow the cat to run away—the dog will immediately look at this as a game of chase. Don’t punish either animal for aggression. You don’t want your dog thinking he will get into trouble if the cat is around. He might decide that his job is to fend off the cat at all costs. Provide a tall scratching post/tower with multiple landings for the cat to rest and observe the dog from a high perch. If the first meeting doesn’t go well, don’t give up. Stock up on more treats and try again tomorrow. It make take many short meetings until the two are comfortably together in each others presence. How will I keep them apart when I’m away from home? Dogs are much easier to confine than cats. Crating the dog may be the solution if someone will be available to let him out at noontime for a walk. If crating is not an option, you may need to separate them in different rooms separated by a door. Infant Gates work great for keeping a puppy confined, but cats will view a gate as a minor inconvenience if she wants to get to the puppy. Once you feel comfortable that they will get along, these extra precautions may not be necessary. To conclude, if you want to share your home with a dog and cat, relax it can be done. Will they become soul mates to each other? 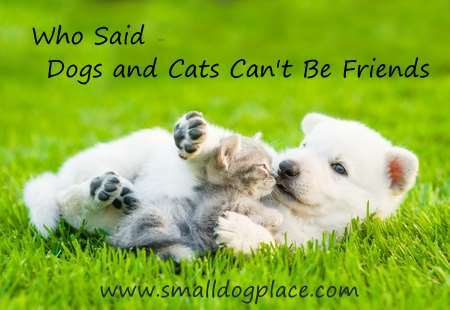 No guarantees there, but cats and dogs can be taught to form bonds and become friends. It takes a little patience and time on your part and enough knowledge of dog breeds to chose a dog that naturally will get along with a cat. Many households have dogs and cats living together, peacefully and happily. Will your home be one of them?